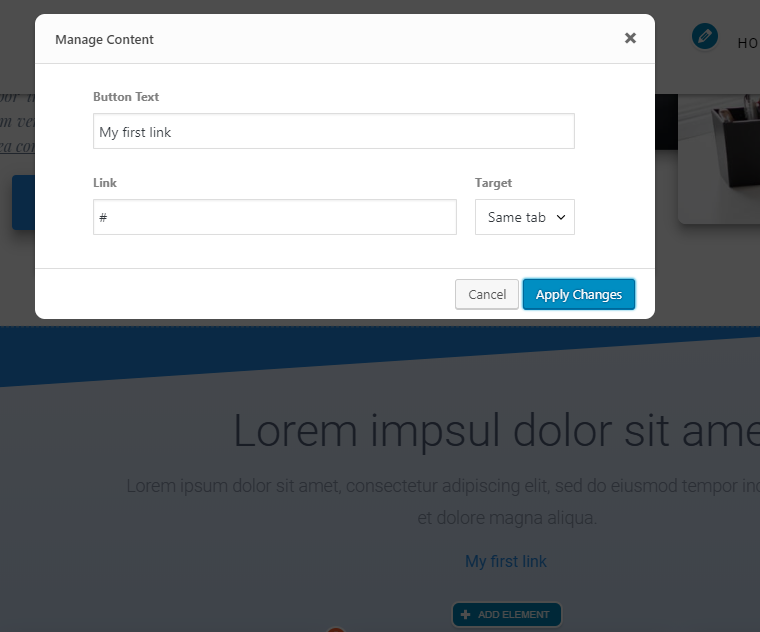 In addition to the content already in place in predefined content sections, you can add some other elements you might need. Go to the live preview, hover over an existing element and an “Add element” button will appear. Choose the element type you want to include in the content section and customize it. Links are the first elements in the list of items you can include in a section. Click on the link symbol and a popup will open, where you can set the parameters specific to that link. Decide whether the link opens in the same tab or in a new tab. Buttons come second in the list of items you can include in a section. Click on the buttons symbol and a popup will open, where you can set the parameters specific to that button. Attach an icon to the newly created button (you can browse through a wide list of available icons). Click on “Add Element” at the bottom of an existing element in a content section, and then click on the image symbol. Upload an image of your choice and crop it for the best match in that section. Click on the H# symbol and select the type of heading you want to include in the content section (H1..H6). It serves to better structure the text in the content sections, and it will better organize your presentation. Use the blue arrow for drag and drop, to rearrange headings in relation to the rest of the text.